Total cost of the project will be Rs. 10 crore (estimated). Project will be funded by internal generation and debt from the banks. 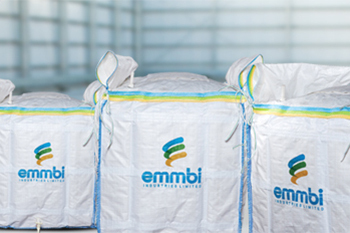 Emmbi Industries climbed 7% to Rs.63.15 on BSE. The company has started a construction of ‘Positive Pressure Clean Room facility for manufacturing of Food and Pharmaceutical Grade FIBC Packaging Material’. The project will take 10 to 12 months to complete and start the production. Total cost of the project will be Rs 10 crore (estimated). Project will be funded by internal generation and debt from the banks. The scrip opened at Rs. 62 and has touched a high and low of Rs. 63.45 and Rs. 58.4 respectively. So far 84970(NSE+BSE) shares were traded on the counter. The current market cap of the company is Rs. 104.28 crore. The BSE group 'B' stock of face value Rs. 10 has touched a 52 week high of Rs. 95.5 on 08-Dec-2015 and a 52 week low of Rs. 15.35 on 27-Mar-2015. Last one week high and low of the scrip stood at Rs. 60.6 and Rs. 44.5 respectively. The promoters holding in the company stood at 57.73 % while Institutions and Non-Institutions held 0 % and 42.27 % respectively.